The dust shield will be formed in the same way as we made the bearing inner and outer race. We will create a section through the dust shield and spin this around the bearing centre to form the 3D component. In the Outliner set the 608-Race to visible and hide all the other parts. 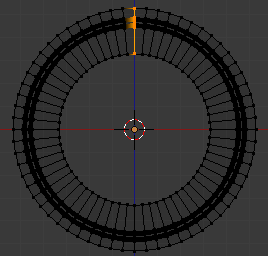 In Object Mode snap the cursor to the 608-Race object to set the cursor in the centre of the bearing. 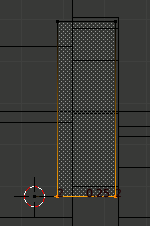 We will start this object with a plane, so press the Shift-A to open the Add menu and click Mesh>Plane. 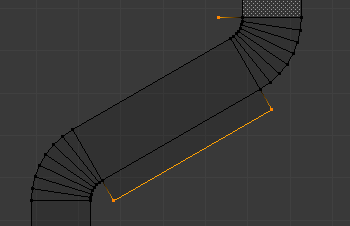 The plane will open in Object Mode and aligned to top view. 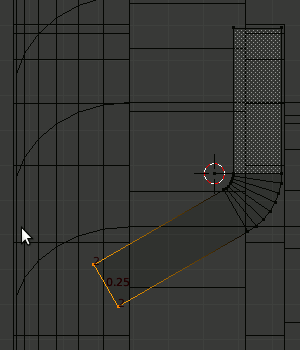 Tab into Edit mode and Rotate the plane 90 degrees on the Y axis. Drag the four vertices of the plane and position them in the retaining grove of the outer race. Go into top view NumPad-7. 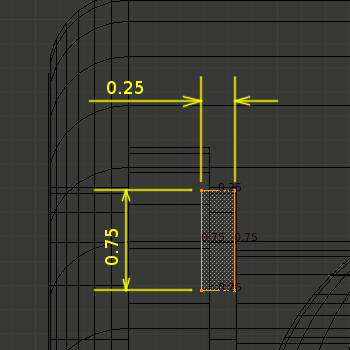 Select All and extrude the plane on the X axis -2. This will give us a face aligned to each of the global axis. We now need to form a bend radius on the shield with a small radius of 0.1mm and a large radius of 0.35mm. The angle between the edges is 120 degrees, therefore we need to spin the bottom face of the shield 60 degrees. RMB select one vertex on the bottom outer edge of the shield. Press Shift-S and snap the 3D cursor to this vertex. 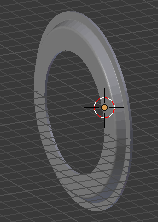 Press A to deselect all vertices then press C for circle select. A circle will appear around the cursor. Paint this circle over the bottom vertices of the cube. 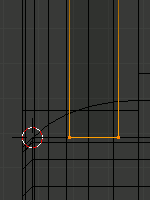 This will select all four vertices of the bottom face. On the Tool Shelf press Spin and set Steps to 7 and Angle to 60. The first bend radius will be formed. Because the cube was constructed from a plane Blender may not know which side of the faces are outside. 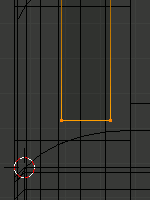 to overcome this select All and press Cthl-N this will recalculate the normals to the outside. Select the bottom face and Extrude it 0.775. Because we are extruding a face rather than an edge the extrusion will follow the face normal and retain the 60 degree angle. We now need to set a centrepoint for the bottom bend radius. 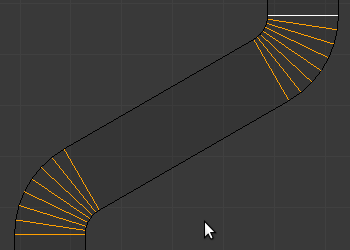 Select a bottom vertex and snap the 3D cursor onto it. Circle select the bottom face and on the Tool Shelf press Spin and set Steps to 7 and Angle to -60. The second bend radius will be formed. We now need to set the distance of the inner diameter of the shield, relative to the inner bearing race. Tab into Object mode and select the 608 Race. Tab back into Edit mode. Select the top most vertex of the inner race and snap the 3D cursor onto it. Tab back into Object mode and select the shield. Go back into side view NumPad-3 and wire mode. Tab back into Edit mode for the Shield object. Select the bottom face of the Shield and extrude it towards the inner race of the baering. 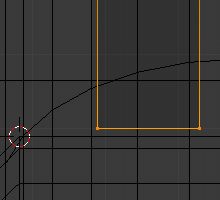 To make the shield touch the inner race Scale the vertices on the Z axis to 0. We now need to add some clearance. Remove the 608 Race object from view by clicking the eye icon in the outliner. 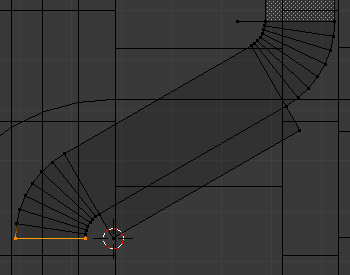 Circle select the reference vertices and press X to delete them. 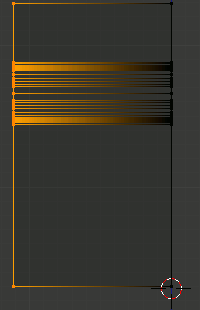 Box select all the vertices that make up the left hand edge and press X to delete them. In Edge Select mode Shift-RMB select all the internal edges and press X to delete them. This will leave you with the profile of the shield. 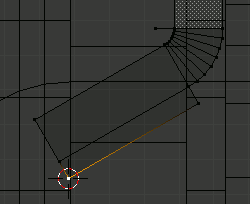 Snap the cursor onto the object centre. Press Shift-S Cursor to Selection. Tab back into Edit Mode and go to front view NumPad-1. On the Tool Shelf press Spin, set Angle to 360 and Steps to 64. 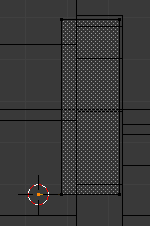 Select all vertices A and remove Doubles W.
The dust shield is now almost complete, but chamfers are required on the corners. In edge select mode loop select the four edge loops indicated Shift-Alt-RMB. Part 4, add a 0.05mm chamfer. 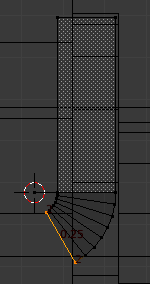 Finish the dust shield by adding an Edge Split modifier also detailed in Part 4. A Dust shield will also be required on the other side of the bearing. Rather than repeating the modeling process we will duplicate this dust shield and Mirror it across the bearing centre. Tab into Object Mode and go to the side view NumPad-3. Check the cursor is still on the object centre. 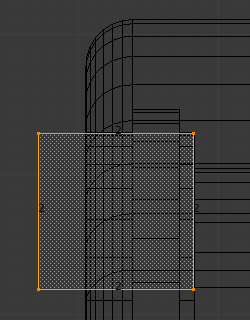 Press Shift-D to duplicate the object then Esc to leave the duplicate on top of the original. Press Ctrl-M for mirror then Y for the axis. Both Dust shields have now been created so it is time to give them a meaningful name. 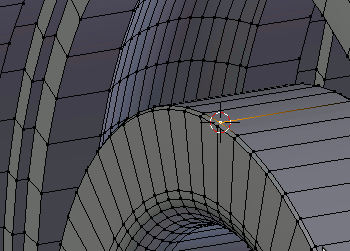 Select Plane in the outliner and then in the Object panel change its name to 608-ShieldA. Repeat this for Plane.001 naming it 608-ShieldB. The final components for the bearing assembly are the circlips that retain the dust shields in place. These are covered in the next section.